Staying true to the original master plan, phase 3 of works was about jumping down in scale and starting to design and build the more intimate spaces of the project. 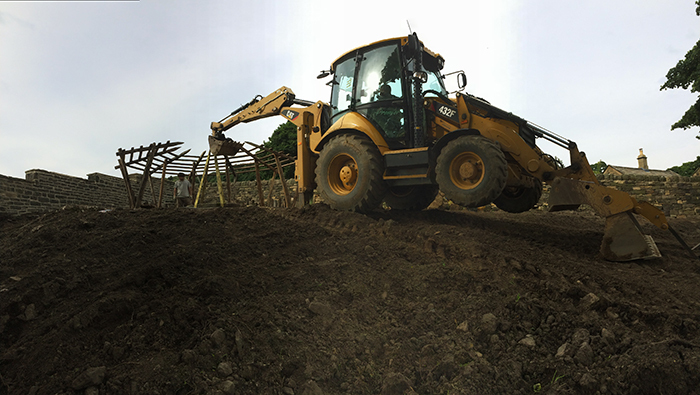 Working closely with a site neighbour and his arsenal of plant machinery the first objective was to carry out the earthworks and grading of the land. 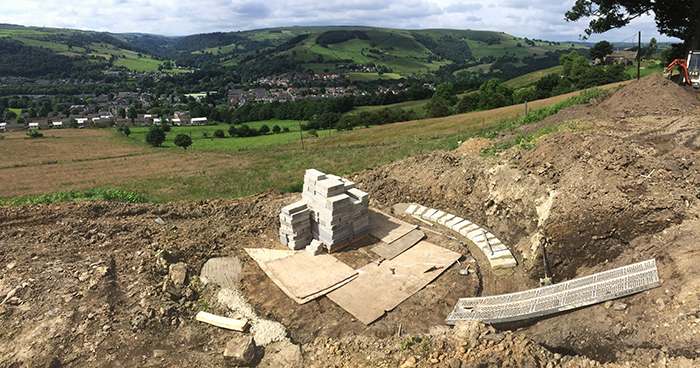 The top area of the site adjacent to the future holiday lets was to be a communal barbecue area taking in stunning views across the valley. A pergola was to provide a sense of intimacy and protection on a very exposed site whilst still remaining open to the wider landscape. 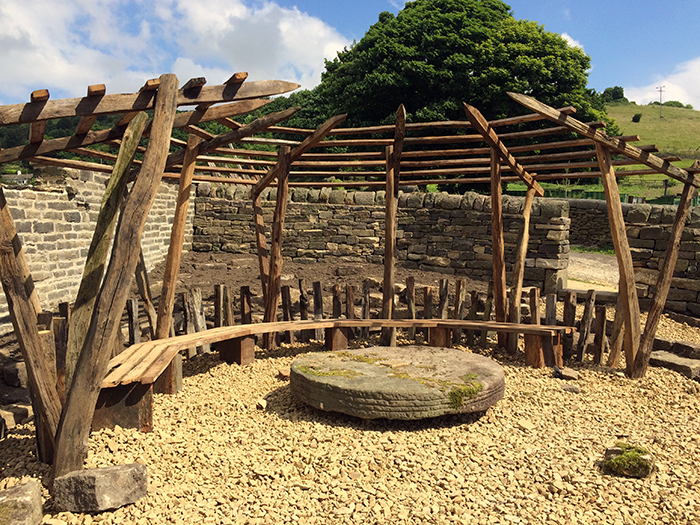 We wanted to maintain a dialogue with the original house and its history so we decided to construct the pergola from reclaimed oak and shape the ground around it with stone found on site. The structure had to be bold and imposing with a sense of permanence and protection to reflect that of the house so the design drew inspiration from fortified timber defensive structures. In subsequent phases, planting around and on the structure itself will help to soften and nestle the pergola into the landscape. 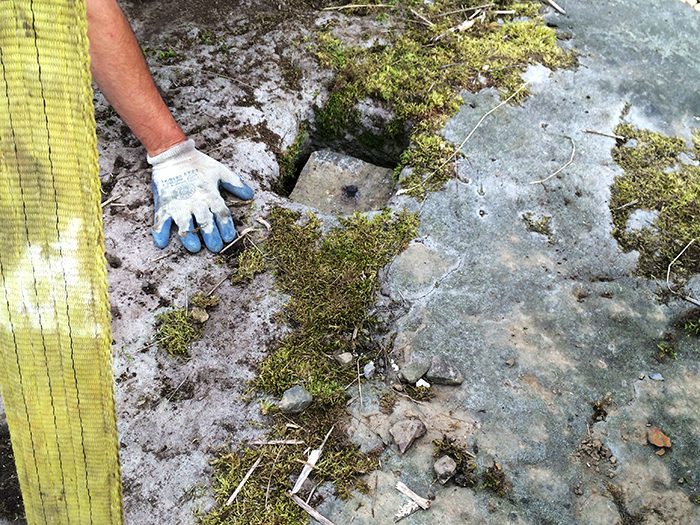 An old millstone found in the lower field was to be used as a central feature. 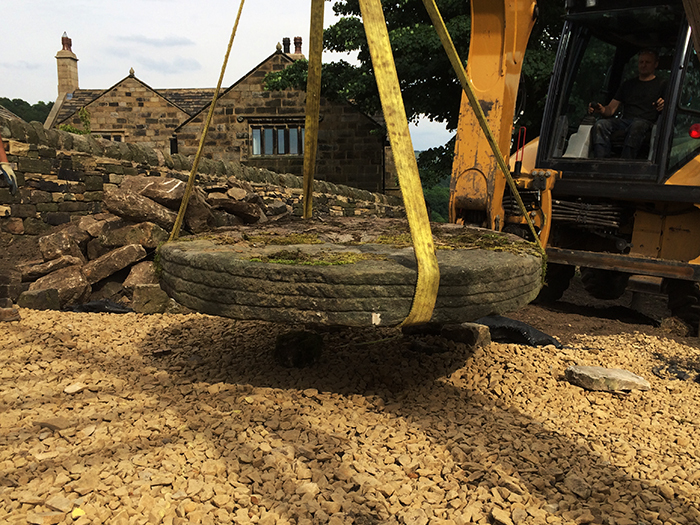 We fashioned a peg from a large ornamental stone and with the help of a JCB lowered the millstone onto it. 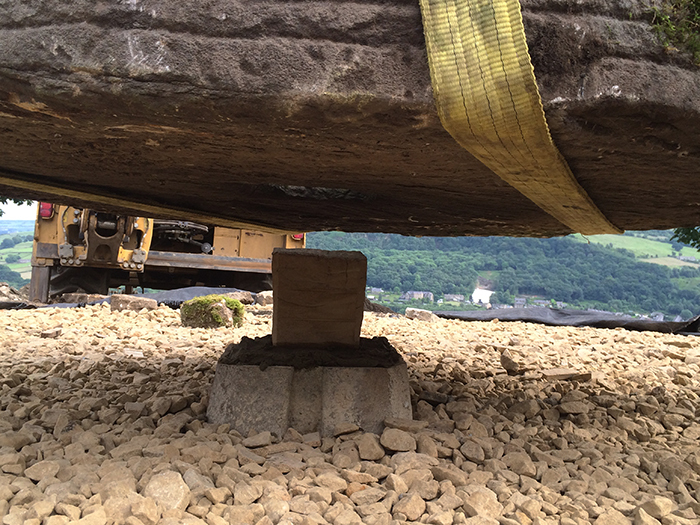 The millstone would appear to be hovering over the ground. 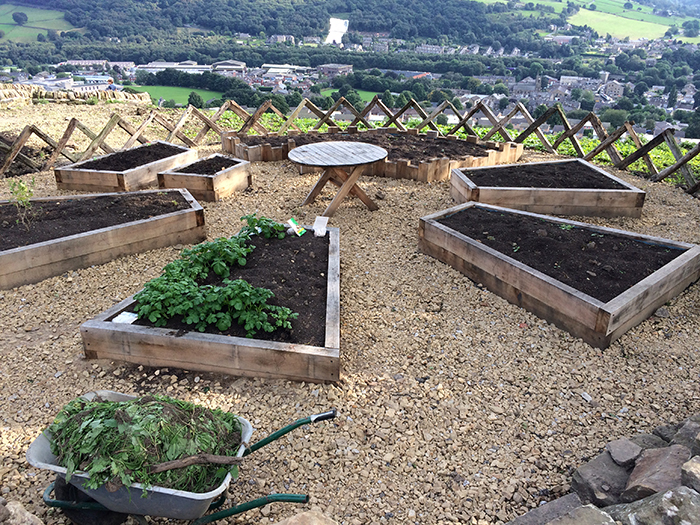 The second area of the garden we wanted to tackle during this phase was the vegetable garden. 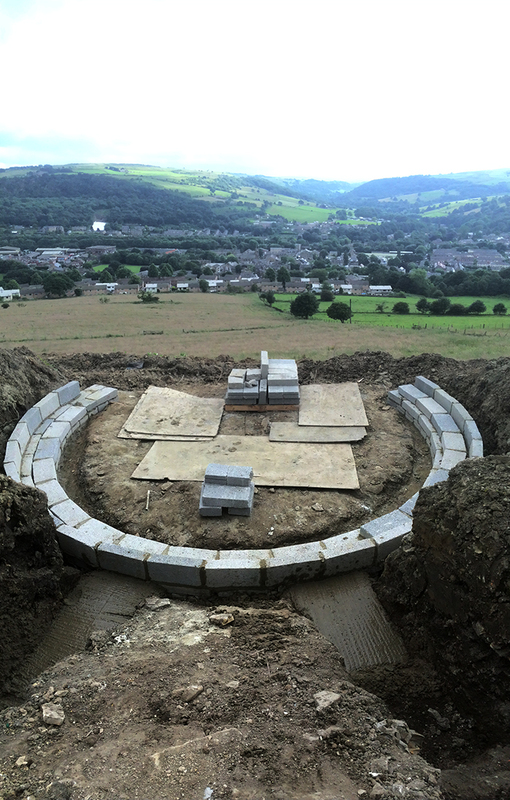 As on the master plan we sited this area to the west side of the grounds to make use of the shelter provided by the boundary walls and to maintain an unobstructed view across the valley from the house. We constructed a low boundary fence around the raised beds from reclaimed oak in a Celtic band pattern to give the area definition and enclosure. 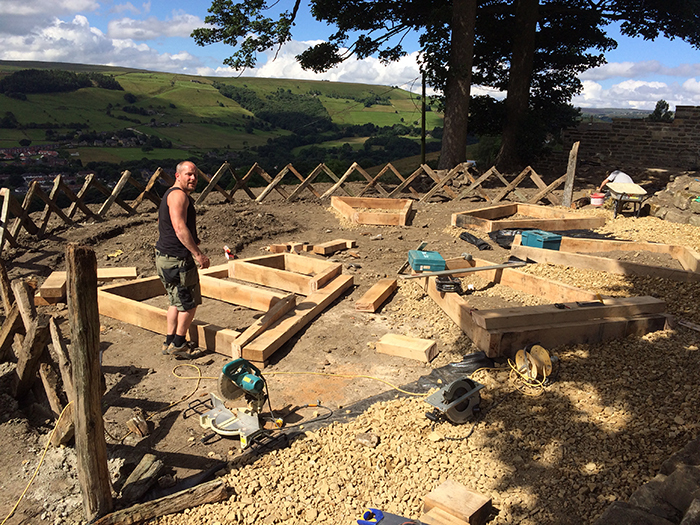 The beds themselves were constructed from new oak orientated around a working table we built from the oak sleepers. A chicken enclosure will be added to the area at a later date. 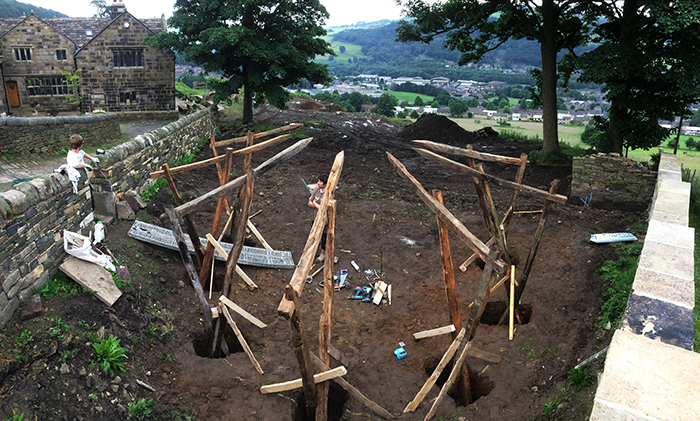 The vegetable garden and communal barbecue area were then linked together with a winding path carved into the bank built up using stone boulders. A surface dressing of gravel will be added later. 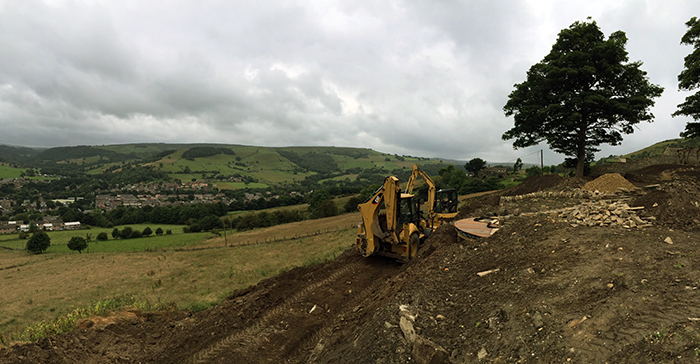 The bank will be seeded with a wild flower mix with pockets of shrub planting during the next phase. 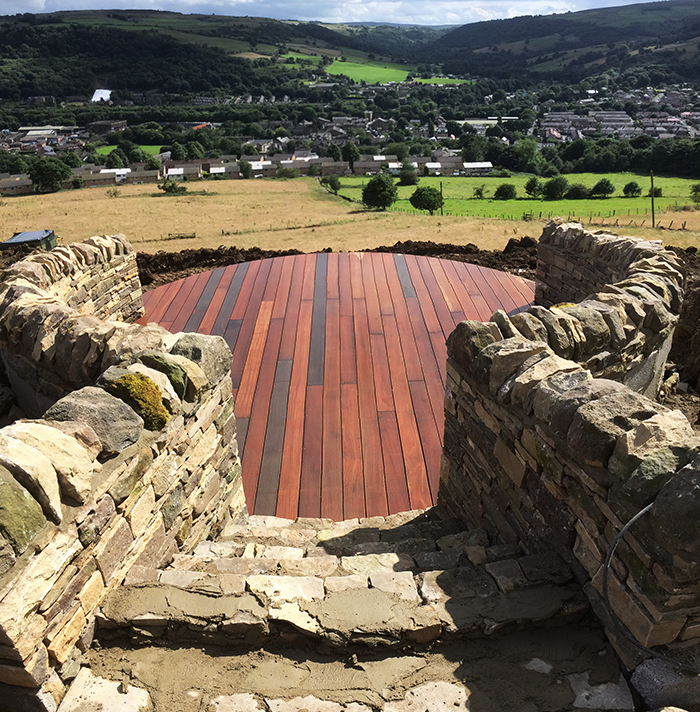 The final aspect of phase 3 was to create a private sunken seating area to take in widespread views up and down the valley. The site is very open and exposed to the elements,Â so the decision was made to carve a walled deck area into the front bank. Sinking the deck would provide shelter from the wind and create intimacy to the space as well as maintaining open views from the house. 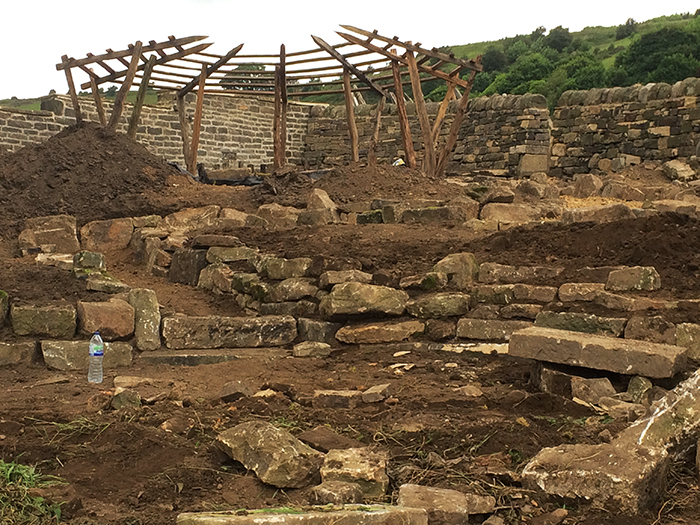 The curving walls were firstly backed with concrete blocks and later faced with Yorkshire stone to appear drystone. 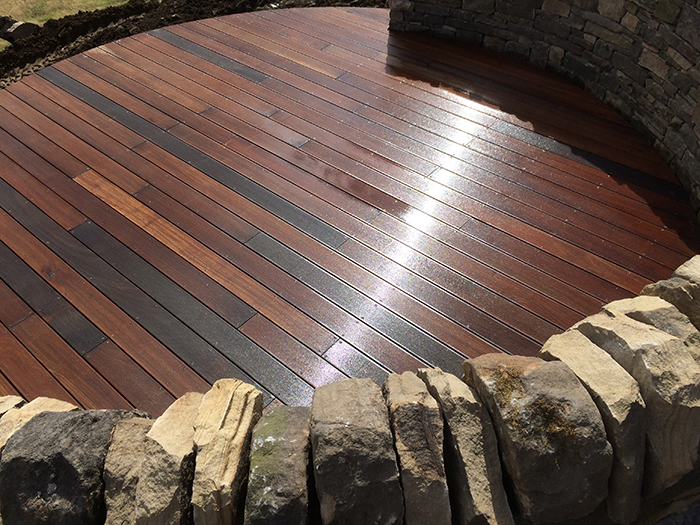 We chose a lightly profiled Balau hardwood to clad the deck with. 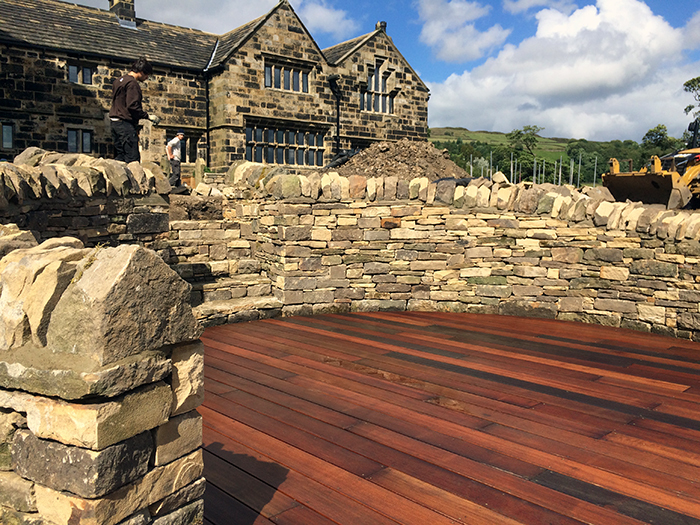 The warm tones of the wood and sharpe circular shape contrast with the rustic charm of the stonework. 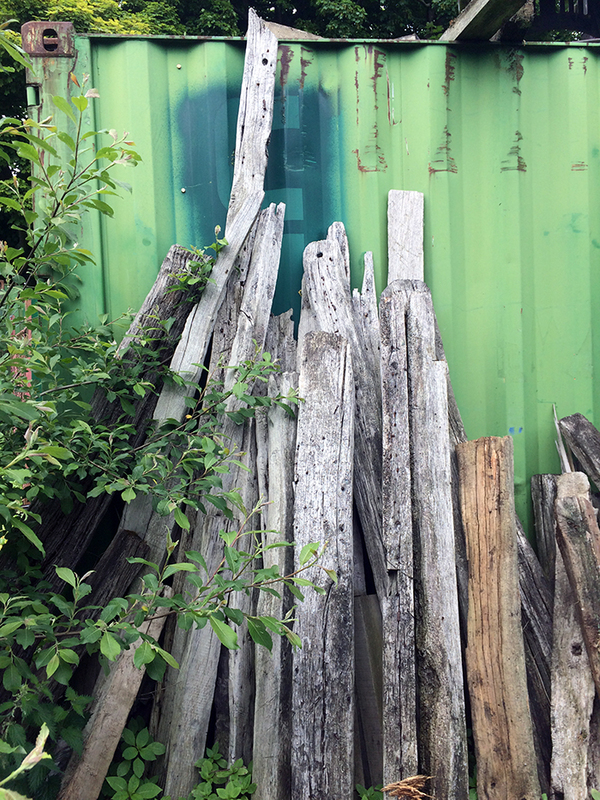 We felt that this juxtaposition of materials would inject a contemporary element of design to the garden whilst still being sympathetic to the wider setting. During the phase 3 works we made provisions for a future lighting scheme by installing the first fix of cables to the key areas of the garden. The lighting scheme will add another dynamic to the whole scheme. 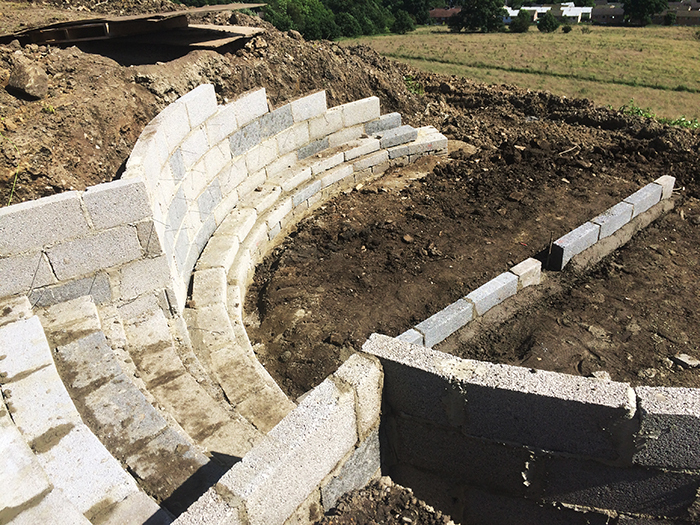 The next phase of works will focus primarily on the planting of the front area which we anticipate on starting in the next couple of weeks.